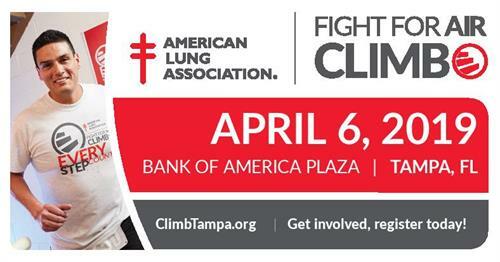 Join us for the American Lung Association's signature fundraising event. This event brings 750 people to the Bank of America Plaza for a unique vertical stair climb race. Fitness Enthusiasts, families and those with a connection to lung disease ascend the 42 flights and 914 steps of the Bank of America building in downtown Tampa raising money to benefit lung disease education, research and advocacy. Come joing us in the fight for clean air and healthy lungs!